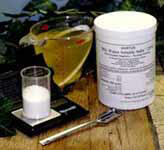 Use by ALL Basal & Foliar Solution Methods. You can make a 'Cloning' Rooting GEL' using Hortus IBA Water Soluble Salts or Rhizopon AA Water Soluble Tablets. Using Hortus IBA Water Soluble Salts or Rhizopon AA Water Soluble Tablets, mix in water to make a rooting solution at any concentration. Add the gel powder (from horticultural suppliers) or corn starch powder (from the retail food market) to the rooting solution. Warm solution temperature is best. Add the powder until you get needed ‘gel peaks' or somewhat watery solution as needed. The resultant 'concentration' is defined as ‘parts per volume’. The rooting 'gel' will be higher volume than the original water based rooting solution. Use of 'Cloning' Rooting GEL' is labor intensive. There many not be improved of rooting: 'Cloning' Rooting GEL' vs Rooting Solutions. For herbaceous crops, where growers use gels by basal application, it may be better to use a foliar method. Why not to use ready made 'Cloning' Rooting GEL' ? Pre-made 'Cloning' Rooting GEL' are mosty sold for hydroponic use. The term 'Cloning' Rooting GEL' is all about marketing from companies that make expensive 'one pony' products. Ready made so called Cloning Rooting Gels have only ONE concentration. The corn starch approach is an INEXPENSIVE WAY to make GELS.